When gaming, you want to take every advantage you can get. In this article, I’ll tell you how to get that advantage. Gaming takes a keen eye, a quick hand, and a sharp mind if you want to be good. Your feet, however, have always been unused. What if your feet could you give you edge up on the competition? What if both your hands were free for shooting, punching, shifting, and other controls? Well, it’s time you do that. If you desire to get a leg up on the competition (pun intended), you’ve got to check out the 3dRudder foot controller. The 3dRudder is a foot-operated controller for VR and non-VR use, and it could very well change your gaming experience forever. There aren’t very many foot controller devices on the market, but there are significant differences between those few devices. So, you may want to think about a few things before purchasing the 3dRudder or any other foot controller device. Do you want to move around or sit? Some devices allow you to sit, while you keep your feet on the controller and move it with your foot movements. Others, require you to stand and move. You don’t necessarily move around the room, but you will need to walk or run in place, etc. If you have limited use of one or both of your hands/arms or only have one arm, a foot controller may be a fantastic new opportunity to have a higher degree of control not only in games but other applications. If you have limited mobility in your lower extremities, then VR shoes are probably not a good option as they require a great deal of movement. Also, if you have only one leg/foot, you may do better with the SprintR (which is for a single foot) rather than the 3dRudder, which is intended for two feet. That being said, even if a device claims to have haptic feedback, it doesn’t necessarily mean that their feedback is good or realistic. 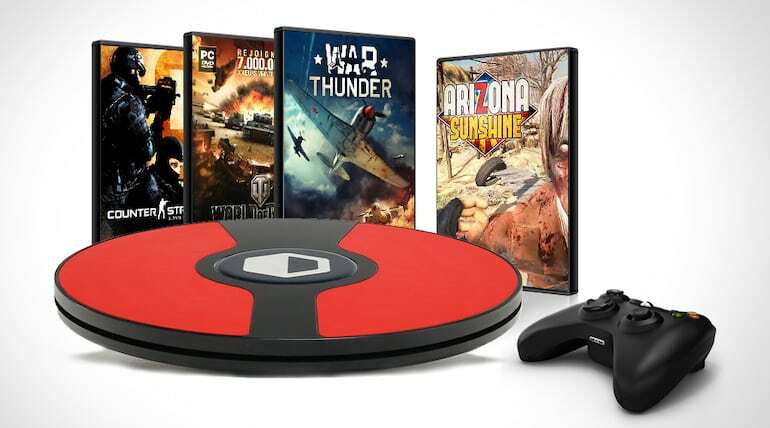 The 3dRudder is a simple, but potentially revolutionary, accessory for both PCs and gaming consoles. The device has a simple, but elegant circular design. At just under 15 inches in diameter, it’s about the size of a Rumba. The top is flat, and the bottom curves are much like a balance board. Some models have fins on top to help position your feet on the controller. 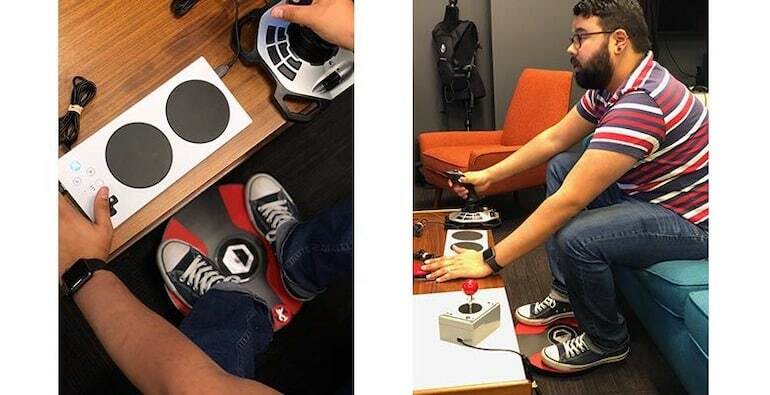 To use the 3dRudder, you sit down and rest your feet on the top of the controller and then move your feet to lean to the left, right, forward, or backward to move your avatar. You can also rotate your feet clockwise or counter-clockwise to turn your character. Pressure sensors and accelerometers track the movement for accurate control, and the pressure sensors can even allow you to move up and down or jump. The device is currently compatible with PC, PSVR (coming in April 2019), Xbox (using the Xbox Adaptive Controller), Oculus Rift, HTC Vive, and WMR VR Headsets and can also connect to a smartphone, Android or iPhone. There are also over 40 games which support the 3dRudder, and that list is increasing. Installing the 3dRudder couldn’t be easier. The foot controller can be connected wirelessly or by USB to get it started. Regardless of the system, it should be recognized and operational within a few seconds. You can further set the controller up for a specific configuration, but it isn’t necessary. Technically, the controller is designed to withstand a weight of up 286 pounds, the controller isn’t intended for you to stand on it. In addition to the possibility of breaking the device, balance becomes a real issue when using it with virtual reality applications. The recommended position is being seated with your knees bent at a 90-degree angle, so your feet rest vertically on the foot controller. So, what makes the 3dRudder so revolutionary? Typically, when playing a game, one hand is used to control your character, whether using a gamepad or keys on a keyboard. Doing this limits what you can do in the game and slows your response time. By shifting the motion controls to your feet, it frees you to use both hands for other aspects of the game. Additionally, the use of your feet in VR applications can reduce the possibility of nausea and dizziness. Your body more readily accepts the movement in the virtual reality world because your feet are moving. Using your feet allows some applications to be played without the transporting and snap rotating, making a more realistic experience. Also, for people who have limited use of one or both hands, you now have a way to use your feet to control not only characters in games, but your mouse or browser in everyday use. The 3dRudder potential really scores here as is customizable both for gaming and other uses. It is compatible with the free TocaEdit X360 controller emulator (x360ce). 3dRudder even provides extensive instructions for the configuration in TocaEdit X360. You can also configure the 3dRudder with JoyToKey which allows you to map the controls of the 3dRudder foot controller to specific keyboard keys or combinations of keys. Doing this can be particularly useful in massive multiplayer online role-playing games (MMORPGs) or other applications which use keyboard shortcuts. Due to the versatility you get by being able to map the controls of the 3dRudder, you can create and save specific configurations for specific applications or situations. 3dRudder even provides pre-created configurations for many of the games which are compatible with their controller. The 3dRudder has leatherette pads for your feet, which helps with grip as well as a rubberized grip on the bottom. One issue, however, that has been reported is that the rubberized grip on the bottom doesn’t grip very well on certain floor surfaces, like hardwood or thick carpet. So, the controller can slide out of position, requiring you to reposition the controller during the game. So, you may want to experiment with your 3dRudder to find the best surface for grip, possibly using a rug or mat to increase the grip. The developers of the 3dRudder have given it several features to make it as adaptable as possible for whatever your needs are. It is excellent as a VR controller and is compatible with your regular PC and console games as well as non-game applications. Let’s check out the features and benefits of the 3dRudder in detail. No longer do you have to give up the use of one of your hands to move around in your game. 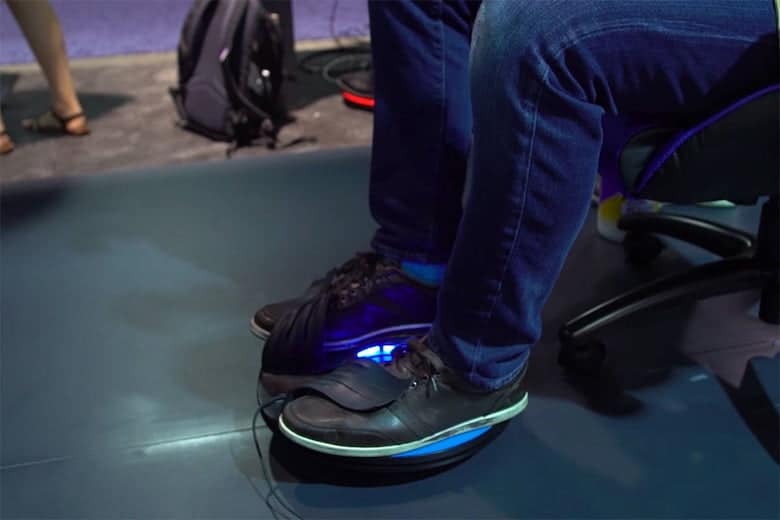 The 3dRudder VR foot controller lets you move your avatar around using your feet, freeing up your hands for other uses in the game. Moving from hand controlled movement to foot controlled movement has the added benefit of reducing the possibility of feeling dizzy or sick while playing VR games. The full body engagement causes your mind to more readily accept the movement in the virtual reality environment as natural. 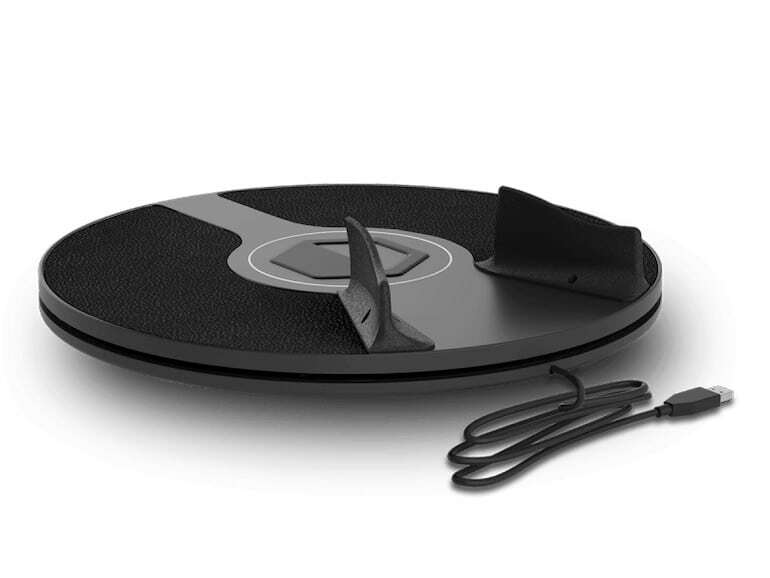 The 3dRudder can be connected either wirelessly or through USB. There is no software to install. You simply connect the device to your PC or console, and within seconds the foot controller is ready to be used. It is truly plug and play. You can also edit the configuration if you wish, but that is entirely optional. 3dRudder says on their website that their device is, “Surprisingly intuitive, it will take you a few seconds to familiarize with the controls of the 3dRudder.” I’m not sure I’d describe it as that quick and easy, but it probably won’t take you long to get the hang of it. The way you have to move your feet isn’t something you typically do. So, you have to get used to that kind of movement. Add to that doing those movements while your opponent is shooting at you or while you’re dodging an obstacle in the road moving at 100 mpg, and you can see how it may take a little bit to get to the point where the movements are instinctual. However, the benefits of freeing up your hands make a little practice worth it. I suggest starting with just the device itself (no game) and practice the movements. Then start with a game you are familiar with while you get used to the using those movements in action. So, many gaming accessories are limited in their compatibility with one console or just a PC. It’s nice to have one that you can use on multiple platforms. Actually, “multiple platforms” doesn’t quite do it justice. You can use the 3dRudder on just about any platform. Originally designed for PC, the foot controller can also be used for VR with the Oculus Rift, HTC Vive, and WMR VR Headsets. 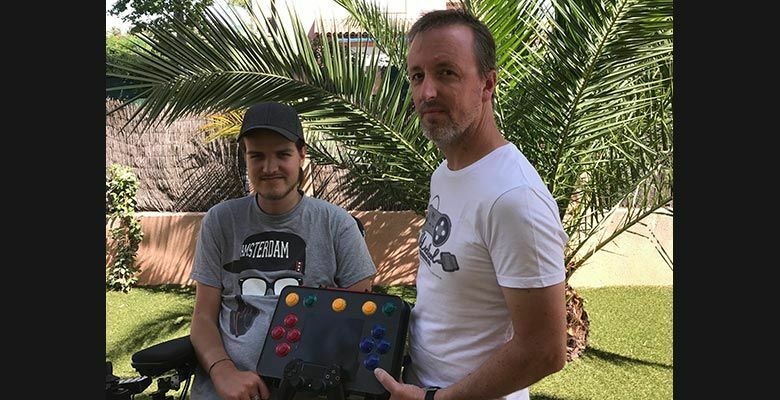 It is compatible with the Xbox as long as you have an Xbox Adaptive Controller and a PSVR compatible version is scheduled to be released in April 2019. As if that wasn’t impressive enough, it can even connect to an Android smartphone or iPhone via Bluetooth. Since the 3dRudder is seen as a joystick controller by your PC or console, it works with a wide array of games and applications. However, there are some games which 3dRudder has worked with to create compatibility specifically for their foot controller. There are currently over 40 games specifically compatible with the 3dRudder. These titles include Honor and Duty: D Day, Forza Horizon 4, Borderlands 2, World of Warcraft, Counter Strike: Global Offensive, Google Earth VR, Killing Floor: Incursion, Doom VFR, Narcosis, Skyrim, Fallout 4 VR, and many more. 3dRudder says they are working with several more game developers for compatibility. So, they will be adding more and more games to the list, including several “big titles” (their words), though they wouldn’t specify which big titles. Maybe games, where you run around or drive/fly, aren’t your thing. 3dRudder may still be an excellent option for you. With the ability to emulate keyboard input, you can use for games and other applications which use the keyboard or keyboard shortcuts. JoyToKey is a magnificent piece of software that enables you to emulate a keyboard or mouse with almost any joystick, gamepad, or other controllers. It is shareware which has a free version that can meet most of your needs, though you can also purchase an inexpensive license for the full version. The 3dRudder is fully compatible with JoyToKey which means you can map the foot controller to be used as a mouse or keyboard. Many people struggle to use traditional gamepads or even keyboards and mice. The ability to use their feet with a controller can open up a whole world of possibility that was closed off to them before. One of the issues in virtual reality is how to move around a huge virtual environment while you are, in reality, in a relatively small space, like a living room or bedroom. Most developers address this with room-scaling, but that only helps so much. By using a foot controller which operates from a sitting position (the position for which most games are designed) you can move freely without the spatial limitations. Movement in VR can be problematic sometimes. When your body is in a relatively stationary position, but your eyes are seeing you moving around, it can make you feel dizzy or nauseated. One solution developers have used to address this is moving avatars in games using teleportation or rotation snaps. This limits movement, but isn’t natural. By integrating your legs and feet in movement, your mind more readily accepts the movement your eyes are seeing which reduces the potential for dizziness and nausea while allowing you to play without teleportation and rotation snaps making the game more natural feeling and immersive. There’s nothing cooler than black. It says your fighter, and you are ready to go. The Black Edition bundle comes with black foot leatherettes, A black plastic design for the controller, and two fins/foot bars. Currently, the Black Edition bundle is only available in the PC and VR compatible model, not the PSVR model. The 3dRudder is less than 15 inches in diameter and just over 3 inches thick. It only weighs about 6 pounds. With its lightweight design and relatively small dimensions, you can take it with you wherever you go. If you want to challenge your friend to a VR game at their house, you can take your foot controller with you and dominate. 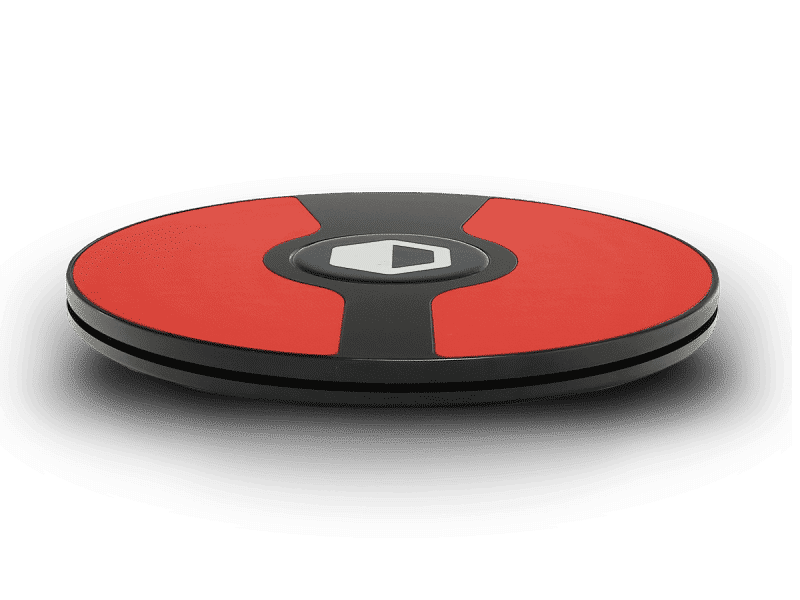 The 3dRudder is a pretty amazing and helpful accessory for virtual reality applications, games, and accessibility. Everything looks great on paper (or your screen), but how does it work in real life? I looked around the Internet to find what other people thought about the device and their comments were pretty positive. The foot controller market is pretty specific, and there isn’t much competition for the 3dRudder. The competition that is out there has some significant differences, almost to the point where it’s difficult to compare. That being said, it’s always good to know what else and how it may be better or worse for your situation before you make a purchase. Below are two alternatives to the 3dRudder which may better suit your needs. 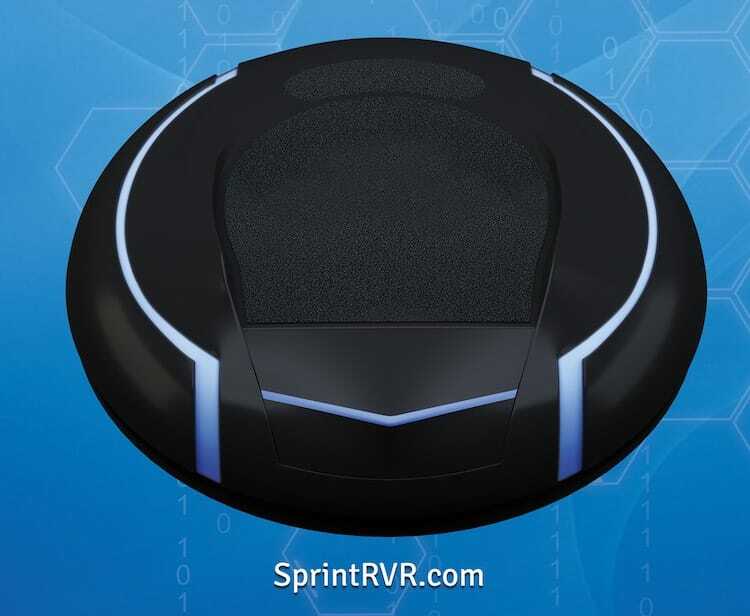 The SprintR VR foot controller is the alternative that is the most similar to the 3dRudder. Like the 3dRudder, you keep the SprintR on the ground while you sit behind it (or stand above it) and you use your foot to move the controller which, then, moves your character. One significant difference, however, is that the SprintR foot controller only has you using 1 foot. Some may find this more comfortable to use while others may find it more difficult. This one-foot design, however, makes it possible to use the SprintR while standing. You don’t put your full weight on the device, but you can stand and have your foot resting on it. Another difference is that the SprintR includes some vibration for haptic feedback. This isn’t a sophisticated form of haptic feedback, just vibration, but it’s something. Finally, the SprintR has a flat bottom. Instead of leaning the device on a rounded bottom, you apply pressure with your foot and push in the direction you want to move. Beyond those differences, the SprintR is very similar to the 3dRudder, allowing for similar control of character movements and for reconfiguration. If you feel like haptic feedback in the form of vibration is a game-changer, then this may be the foot controller for you. Also, if you prefer to sit with your legs apart, the SprintR lets you do that. For accessibility, if you only have one foot, then you need to go with SprintR as the 3dRudder is designed for two feet. It should be noted that the SprintR foot controller is not yet available for normal consumer use and is only available as a devkit. You can check it out here. This foot controller is quite different from either the 3dRudder or SrintR VR foot controllers. 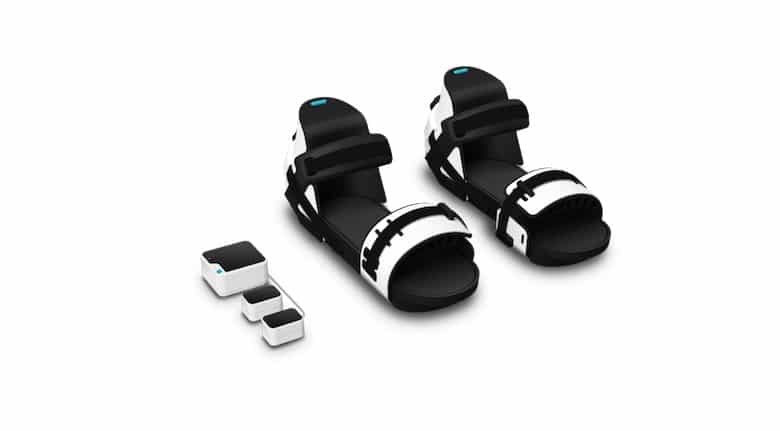 The Taclim VR Shoes slide onto your feet, similar to a pair of sandals. Moving in the VR shoes requires you to physically move around. You can walk or run in place to move your character and can even do kicks. The Taclim VR Shoes also have a somewhat more realistic VR haptic experience than the SprintR. You are supposed to be able to feel whether you are walking in sand, on hard floors, etc. It does a decent job most of the time, but they haven’t mastered the haptic feedback very well, and some surfaces feel quite unrealistic. The Taclim VR Shoes might be a good fit for you if you want to move around and really want a haptic experience. It should be noted that the Taclim VR Shoes do not currently appear to be available. You can learn more about Taclim VR Shoes at https://taclim.cerevo.com. These are shoes, like sandals, instead of a board you rest your feet on. The 3dRudder is a wonderful VR and gaming accessory. It can free your hands and give you an edge against your competition. It can also make games and computer use more accessible for those who struggle to use traditional gamepads, mice, and keyboards. The foot controller may also let you play virtual reality games in a more natural and engaging way, eliminating the need for teleportation and rotation snaps and making your experience more immersive. The 3dRudder is a fantastic innovation that is worth checking out. You can find more information or get your 3dRudder VR Foot Controller by clicking here. If you have used a 3dRudder or one of the other foot controllers, leave a comment and let us know what your experience was like.